A vitamin E dietary supplement with EPA and DHA omega 3 fatty acids from highly stabilised fish oil obtained by cold extraction. 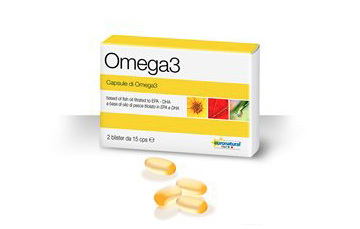 Omega 3 capsules are formulated to control plasma triglyceride levels. These nutrients are particularly recommended for people on carefully controlled diets, to promote the physiological levels of triglycerides and to aid vascular functions, reducing the risk oh heart and coronary disease and controlling the atherosclerotic process. A study cunducted by the American Journal of Clinical Nutrition analysed the bone mineral density ( BMD ) of more than 1500 people between the ages of 45 and 90, over a 4 year period. Their findings demonstrated that omega 3 can play a vital role in preserving the integrity of the skeletal system even later in life. The recommended dose is of 4 capsules per day with a glass of water, divided mong meals.